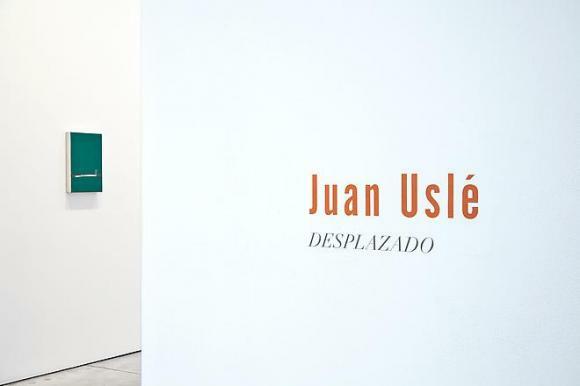 Cheim & Read is pleased to announce “Desplazado” - an exhibition of recent paintings by Spanish artist Juan Uslé. Uslé has been showing with Cheim & Read since 1997; his last exhibition with the gallery was in 2008. Uslé’s paintings are sometimes referred to as inviting, even “warm” – they urge the viewer to look closely, to visually untangle the layers of line and color and experience the way in which the painting was made. In the current show at Cheim & Read, several works are apt examples: Solitaires, 2011, Landropo, 2010-11, and Think Twice, 2010-11, have wide brushstrokes which dominate the compostion; Unfolding Manthis, 2010 and Fagocimanthis, 2010, present central motifs backed by dense, light-filled checkerboards of undulating color. Radiating lapis blue is interrupted with shards of turquoise in Inclinado (Nikritin), 2010. Veils of muted hues are punctuated by bright color in Desplazado, 2010, a small painting which gives the show its name. All convey the sense of Usle’s continuous searching: "I’ve had fun, worked hard and discovered the world, but I've never felt the whole sense of a place. Maybe that is what I look for."